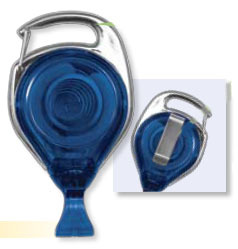 Carabiner-style badge reel with chrome outer frame, slide-type belt clip and no-twist u-shaped bullet that snaps into place. Keeps ID facing forward. Available in solid and translucent colors. Select desired color.